Click HERE to view ASE's 2014-2015 WASC report. "Accreditation is a voluntary dual-purpose process that schools (1) must be worthy of the trust placed in them to provide high-quality learning opportunities and (2) clearly demonstrate continual self-improvement. 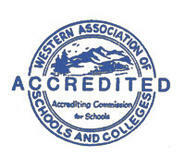 An accredited school is focused on a mission and goals for students; it is student-oriented and examines its students' performance continuously; it accepts objective evaluation from a team of outside peer professionals trained by WASC; it maintains a qualified faculty within an effectively organized school; it collaboratively assesses the quality of its educational programs on a regular basis; and it plans for the future." The Academy of Scientific Exploration (ASE) is one of four High Schools located on the Cesar E. Chavez Learning Academies Campus. ASE was part of LAUSD's Public School Choice 2.0 process. The idea of ASE began with a team of teachers who wanted to provide a better educational option for students in the Northeast San Fernando Valley. For many of them, this area is their home either because they have worked with students in this area for many years or they grew up here and still live in the area or still have family in the area. As a result of this, this school, the welfare of our students and everything else about it is very personal for us, this is our home and this is our family (#aselove). The team worked for well over a year to develop a teacher-driven, student-centered plan that was presented to the community and the LAUSD School Board. The team was awarded the school and ASE opened it's door in 2011 and has focused on academic excellence, equitable access, and individual integrity ever since. If you are interested in viewing the Request for Proposal that ASE presented to the community and the LAUSD School Board, click HERE. If you are interested in information about the Public School Choice Resolution, click HERE. The Academy of Scientific Exploration (ASE) cultivates a community of learners devoted to academic excellence, equitable access, and individual integrity. Our academic program develops critical thinkers and lifelong learners who attain mastery in all core subjects, with an emphasis in math and science, in order to become college-prepared and career ready. ASE meets the needs of diverse learners and teaches all students effective communication and leadership skills while building character as a means to empower all stakeholders to make a positive impact in their community. and, when given a productive learning environment, have the ability to learn and succeed. The Academy of Scientific Exploration provides a relevant, rigorous, high-quality, standards-based curriculum with an emphasis in mathematics, science, and technology. Students complete a college prep curriculum that fulfills A-G requirements and features community service and project-based learning strategies. To ensure equitable access, students participate in enrichment, intervention and test preparation programs based on individual need determined by multiple data-driven assessments. A character-focused curriculum is embedded throughout the educational experience, and students demonstrate leadership through activities based in collaboration, team building, advocacy, mentorship, community outreach and service. ASE empowers all stakeholders -- parents, teachers, students, administrators, and the community -- to play a vital role in the development of student education, character, and leadership skills.